You will be able to have your 300 or 400 Helix shipped within 48 hours, and installed and operating in your process quicker than you ever thought possible. The standard Helix is easy to disconnect and clean. For applications where complete cleaning is required, use the Hi/Lo Helix which will raise and lower with a pushbutton, making change out and cleaning a breeze and saving you a lot of time and money. The Helix is an enclosed conveyor so if the inlet and discharges are sealed properly, your dust will be contained. Improve your dust containment with and Integral Dust Collector on your inlet hopper, so that when you are dumping the small (50 lbs.) of material into the Helix, the dust will be collected and put back into your product stream. The Best Value in Bulk Material Handling. Flexible screw conveyors have been used in the dry processing industry for decades. This reliable, simple and low-maintenance bulk material handling equipment uses a single moving part to effectively convey dry material from one point to another. These conveyors are also known for their versatility, allowing for horizontal, vertical, and degreed-bend applications. Engineered for batch, intermittent and continuous conveying of bulk materials. Flexible screw conveyors are an economical solution for conveying powders, crystals, pellets, friable material, flakes, granules and much more. Convey horizontally or vertically with a flexible outer tubing and auger that allow for easy maneuvering into elevated hoppers and bending around obstacles. Fewer components minimize maintenance. 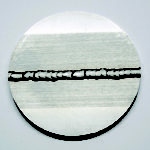 The simple operation of a helicoid screw rotating inside a fixed tube keeps costs low, reliability high. Rugged construction. Though not recommended, the Helix’s standard stainless steel construction can stand up to a continuous flow of abrasive materials (carbon steel and polyethylene models are also available). Convey materials over distances up to 80 ft (24.4 m) and discharge heights up to 40 ft (12.2 m). 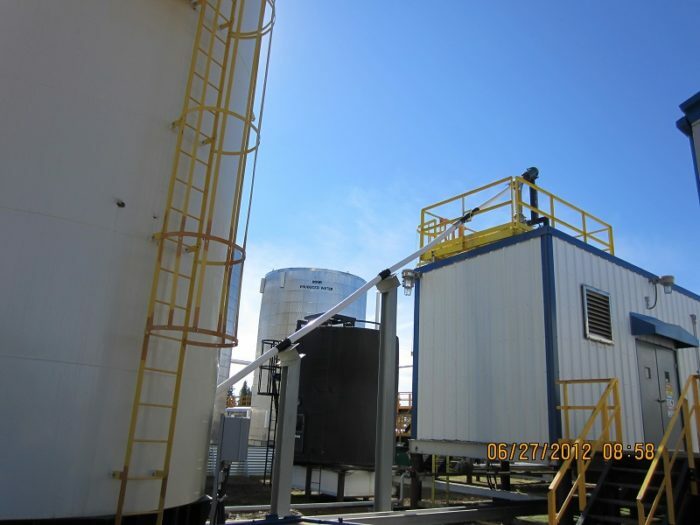 An optional mobile base provides a discharge height of 12 ft (3.66 m). Easy to clean. Flexible screw conveyors can be disassembled in 5 minutes for thorough washdowns. Versatile, economical conveying systems shipped in 48 hours or less. We designed our Hapman Helix Flexible Screw Conveyors to provide customers with an economical conveying method that can be used for most types of dry material handling applications. Best of all, Hapman Helix Flexible Screw Conveyors can be selected, ordered, and shipped in 48 hours or less with our Quick Ship program (applies to standard Helix Flexible Screw Conveyors only). Flexible screw conveyor operation begins when product enters the sealed tube as the auger rotates (the shape, design style, size, and length of the auger are factors selected for each specific bulk material handling application). Flexible screw conveyors are typically mounted to a hopper for easy loading of material. 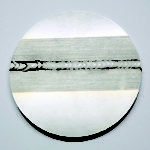 A single motor drives the auger rotation, which pulls the material through the enclosed tube. The helicoid design of the auger effectively conveys a wide range of materials from powder, to granular, to larger particles. Hapman Helix Flexible Screw Conveyors come in many standard sizes to meet your bulk material handling needs. Ranging in capacity from 15 cfh to 1800 cfh with the ability to move material up to 80 ft, Helix Flexible Screw Conveyors are versatile, cost-effective, and easy to clean. Sanitary-grade bulk material handling equipment and components for safe and efficient conveying. We have a broad range of options for our Helix Flexible Screw Conveyors when your material handling operation must meet certain sanitary requirements. With bulk dairy powders or other food grade product that has the potential to get stuck or trapped in conveying systems, our sanitary features will comply with FDA and USDA conveying and cleaning guidelines to keep your facility food-safe and regulation compliant. Access internal conveying components quickly and easily. Quick-release Tri-Clamp connectors let you dismantle the conveyor without tools so it’s 100% open for cleaning or maintenance in a few minutes. Meet dairy-grade standards on all product contact surfaces. With our Helix Flexible Screw Conveyors, we are the industry’s only conveying systems manufacturer listed by the USDA for Dairy Grading applications. Sanitize all conveying components to your stringent regulations. Our Quick Ship program for standard Helix Flexible Screw Conveyors includes unit selection, ordering and shipping in 48 hours or less. Convey 0.5 to 1.5 ft3/min. in a completely enclosed conveyor. The Hi/Lo Helix conveyor tilts down easily for efficient batch changes and cleaning without ladders, lifts, or a maintenance crew. The switch-operated electric motor gives one operator the ability to simply and easily lower the conveyor, remove the auger, and change it or clean it. This ergonomic design keeps workers safely at ground level while providing maximum conveying options. Your best choice for controlled flow of bulk material. When your bulk material handling needs require a controlled flow without measured output, Horizontal Push Helix Flexible Screw Conveyors are well suited for your needs. Our engineers developed this economical bulk material handling equipment in response to a growing industry demand for simple, easy-to-use conveying systems that reliably transfer product from one location to another. Horizontal Push Helix Flexible Screw Conveyors reduce instantaneous material load, thus avoiding potential material clogging or back-up. These conveyors also allow for gradually introduced product into a feed line or other production equipment. Helix 600 Series Flexible Screw Conveyors are suited for quickly and effectively emptying storage totes or intermediate bulk containers (IBCs). The Tri-clover inlet connection is housed under a protective cover that slides to the side when the conveyor is in use. The inlet is designed to mate with the discharge valve of the tote or IBC, signaling the valve actuator to open the valve. As the valve opens, bulk material is automatically discharged into the conveyor, which delivers the product or ingredients to another conveyor, a mixing station, extruder, packaging line, or other process-related area. Hapman offers a wide range of auger styles and sizes to fit in flexible screw conveyor casings 2-8” in diameter (5.08-20.32 cm). 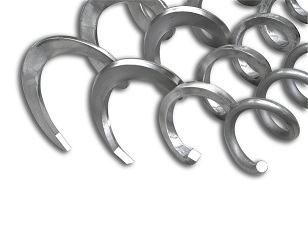 Each auger is specifically engineered to effectively move product depending on material type and operating conditions. Our application and engineering team will work with you to determine the best auger for your application. A wide range of conveying options and layouts. Our Helix Flexible Screw Conveyors are available with a several options for easy implementation into specific plant applications. 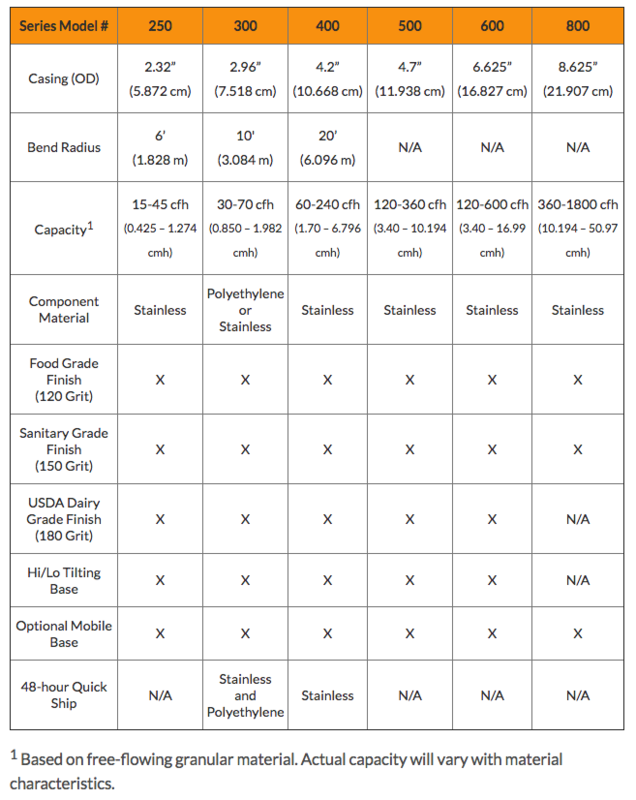 Food grade, dairy grade, stainless steel hopper, TEFC motors, and portable units are available upon request. The Helix is available in many configuration types. A range of hoppers in standard and custom sizes as well as flanged inlets; mass-flow hoppers available. Loss-In-Weight (LIW) Helix Flexible Screw Conveyors are fully automated dosing systems that allow for batching material. The Integral load cells indicate when volume is within 5 lbs of set maximum by slowing flow. The conveyor will shut down within +/- 1 lb of the maximum volume set point. A number of conveyor paths are available to ensure your material gets to where it needs to go. Combination paths are possible. Helix Flexible Screw Conveyors can be used in many applications. Here are just a few examples of how the Helix keeps material moving effectively and maintains a safe, clean, and dust-free plant. 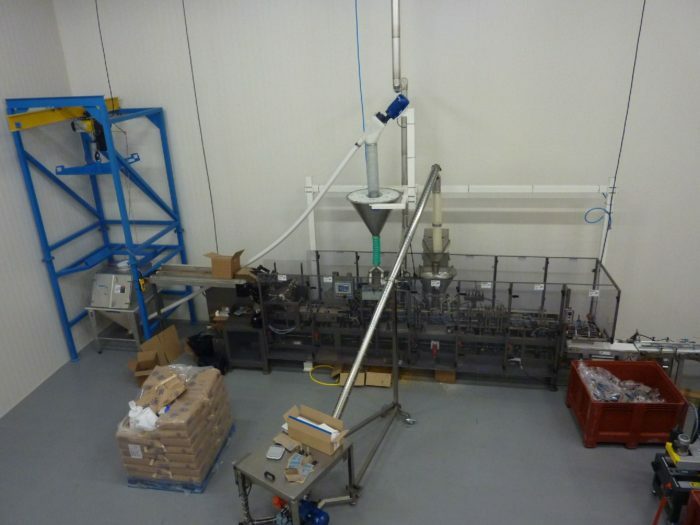 Popcorn Packaging Line – A Hapman P300 Helix conveyor is used to refill a Hapman supplied holding hopper above our customer’s popcorn packaging line. This conveyor is serving as an intermittent refill device, sized to stay ahead of the packaging line and refilling to a high-level sensor in the holding hopper as needed. This is a 3” conveyor and the refill rate is about 600 lbs/hour. Material conveyed is salt and popcorn, individually, not as a mix. 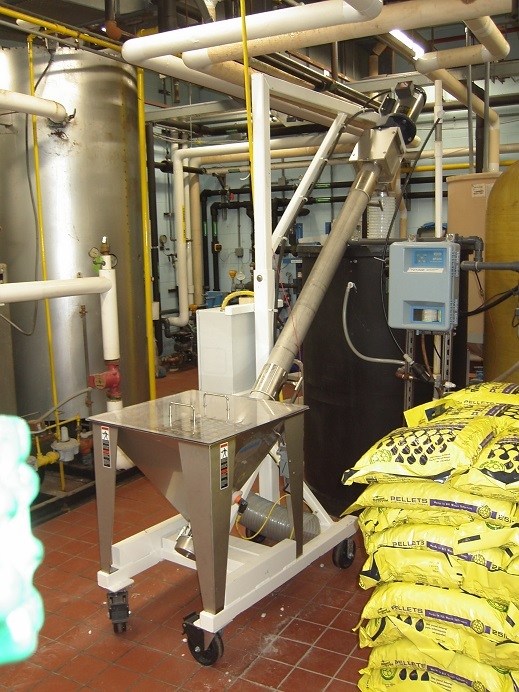 Salt Pellet Conveying – A food manufacturing company wanted to provide a way for their employees to feed their water softener tanks with salt pellets. The bags weigh about 80 lbs and the tank height is over 5 feet. Our portable 4” Helix flexible screw conveyor dumps the salt pellets into the conveyor hopper at floor level and can be rolled around for use at different tanks. Building Material Conveying – A roofing manufacturer in Georgia needed a way to convey different color roofing granules weighing about 120 lbs/cubic ft into their mixer. 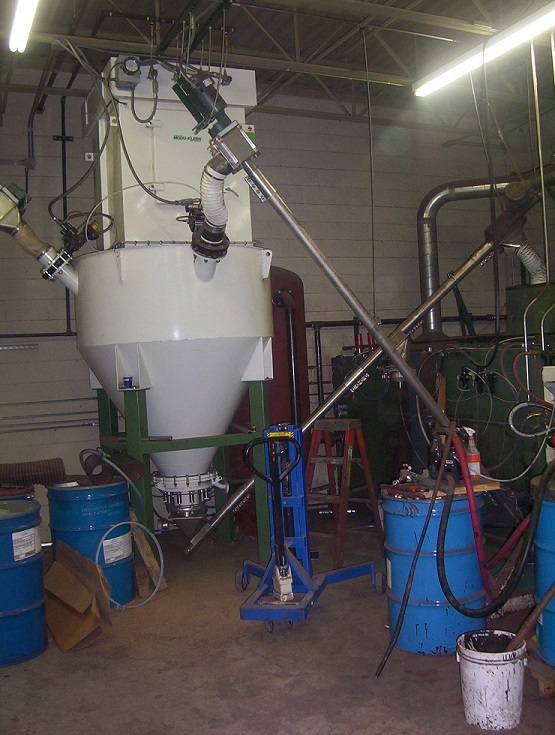 We provided a flexible screw conveyor to feed the mixer, unload the mixer, and send reclaimed product back into the mixer to help minimize product loss. These are 3” conveyors with stainless steel tubes and a heavy-duty square bar auger. The roof granules weighed about 120 lbs/cubic ft.
Industrial Material Conveying – A tire manufacturer needed a way to convey bulk material from their in-house silos to a common batch hopper. We provided our series 600 (6” diameter) Helix flexible screw conveyors with stainless steel components, complete with butterfly valves located at the conveyor discharge. Each of the conveyors would batch a set amount of ingredients required for making the tires into a common hopper. The average bulk material handling rate for these conveyors was about 6-8 cubic ft per minute. 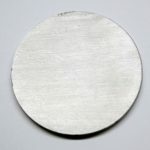 The materials conveyed included Tio2, Zinc Oxide, Carbon black, and Calcium Carbonate. Do You Have Helix Flexible Screw Conveyor Questions?